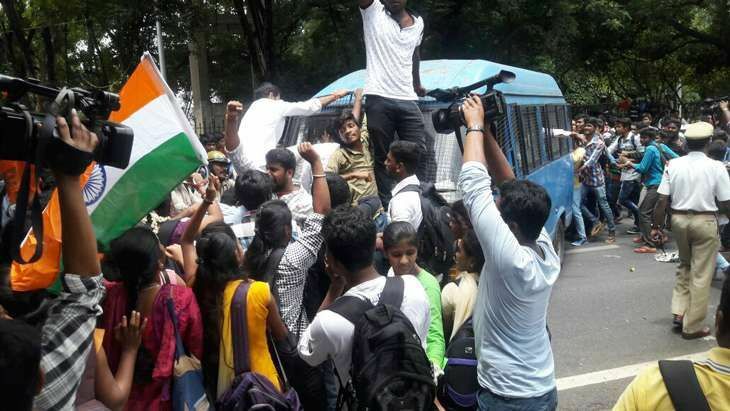 The Bharatiya Janata Party (BJP) on Saturday alleged that the Congress Party was trying to intervene and influence the police probe against the Amnesty International in Bengaluru, which has been booked under the sedition charge for allegedly raising pro-Kashmir freedom slogans at an event. Union Minister of Information and Broadcasting M. Venkaiah Naidu said that the Congress Party has, as usual, taken a political and opportunistic stand on the issue. "Chief Minister of Karnataka says anti-national slogans will not be tolerated. But Congress general secretary Digvijaya Singh steps in and tells the Chief Minister not to take action and tells that party vice president Rahul Gandhi do not want action to be taken," he said. "In such a serious case, it is for the police to decide. It is for the state to investigate. How come Digvijaya Singh dictate what is to be done and what is not to be done? And how come Rahul Gandhi get involved into this?... They (Congress) are trying to intervene and influence police probe," he alleged. The Union Minister also cornered the Amnesty International, saying it was running away from its responsibility for what has happened during their program. "You organise a meeting, you call the people and they say and shout something and then you say you have no responsibility. Raising Pro-Independence slogans means demanding division of the country. It is nothing but 'anti-national'. It is sedition. It is quite surprising that this organisation Amnesty international say that they are championing the cause and the civil rights of the people," Naidu said. "Any organisation which hosts a programme, where anti-national slogans are raised or demands are made, they should take the responsibility for the same," he added. Dubbing the registration of sedition case against Amnesty International over anti-India slogans being raised at an event as 'unnecessary', Digvijaya Singh had earlier wondered as to why no case has been registered against the Peoples Democratic Party (PDP) leaders who have been raising slogans of 'azadi'. Singh, who is the party's general secretary in-charge of Karnataka, said such laws are of the British era and added that chanting slogans is not a crime. "To chant slogans is not an anti-national activity. These laws are of the British era. Slogans of 'azadi' are chanted by the people of PDP which is Mehbooba Mufti's party. Why no case is registered against them? The Government of Karnataka is rethinking in this matter and I believe that no FIR should have been registered in this case," said Singh. The police on Monday filed cases, including one of sedition, against the organisers of a programme that sought to project the human suffering of the Kashmir conflict. The police last week charged Amnesty International India under Section 124A of the Indian Penal Code, which defines sedition as brings or attempts to bring into hatred or contempt, or excites or attempts to excite disaffection towards the Government of India. Unnamed representatives of the non-government organisation were also booked under Sections 142,143, 147, 149 (unlawful assembly and rioting) and Section 153 A (promoting enmity between groups). Reacting to the FIR filed by ABVP, Amnesty International India in a statement said the allegations mentioned in the complaint are without substance, adding it is an attempt to prevent the families of victims of human rights violations in Jammu and Kashmir from having their stories heard. Earlier, senior advocate Prashant Bhushan's NGO Common Cause moved the Supreme Court challenging the "misuse and misapplication" of sedition laws in the country. The Public Interest Litigation (PIL) filed by Bhushan says that the sedition law is rampantly abused to instil fear, causing persecution of students, journalists, intellectuals engaging in social activism.